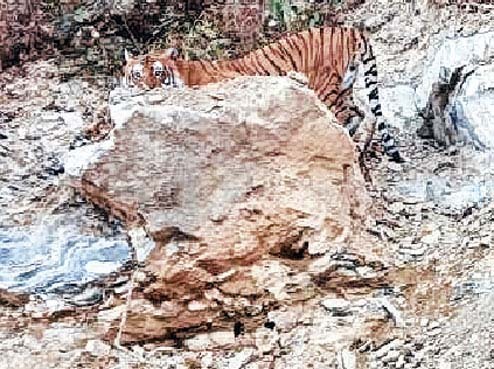 Harka Bahadur Chhetri, 26, a Pedong resident, was at the wheel of his Maruti Alto 800 when the big cat appeared before him. I had four passengers, including three ladies who were in the back seat. To my left was a senior gentleman from our village. We had left Pedong (20km from Kalimpong) around 6am and were on our way to Mal Bazar (in the Dooars) via Lava and Gorubathan. The morning, as you would expect in the winters, was very cold, but we had no inkling that a chilling experience was awaiting us less than an hour into our drive. When we reached a place between Algarah and Lava, a tiger suddenly appeared. All I can remember is ... all of us spoke up together and said "tiger!" I stopped the car and the tiger crossed over to the left side of the road. It all happened in just few seconds. I had the presence of mind to grab my phone in the hope of capturing the big cat in my camera. I remember trying to shoot a video but somehow, I failed to tap the record button. We were scared and my hands were trembling. I somehow took a picture of the tiger in my camera as I heard it growl. Then we sped away. The driver of the car behind me later said he could see the tiger from behind. I have seen leopards in the hills. But I promise you, I had never dreamt that I would come face-to-face with a tiger. On the way to Mal Bazar, I told several people, including fellow drivers, about the tiger to alert them. Around 10am, I uploaded the only picture I had managed to click on Facebook. Soon, I started getting calls, including those from forest officers. A fellow driver, Dinesh, had given my phone number to forest officers. Harka Bahadur Chhetri, 26, a Pedong resident, was at the wheel of his Maruti Alto 800 when the big cat appeared before him., When we reached a place between Algarah and Lava, a tiger suddenly appeared.